Click HERE to purchase! Eileen Henry is one of the original Child Sleep Consultants. Her approach is unique and as you can see from the polarized reviews, has inspired strong feelings. Strong feelings and emotions are her specialty and a natural part of parenting, change and learning new habits. Crying is often part of the strong feelings expressed by both the child and parent. Supporting the self and the child in our feelings is the ongoing solution to development. Responsiveness is key and Eileen’s knowledge of Attachment Theory is extensive and the foundation of her sleep program. Eileen’s take on new SIDS recommendation: Click HERE or on image to view! 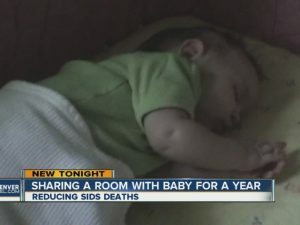 Sleep specialists respond to the AAP’s recent announcement that infants should roomshare with parents for a full year. For more data and information on these topics please visit my blog posts. Does the New Recommendation Apply To You? 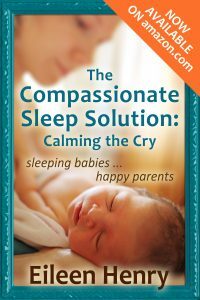 Click Here to listen to an interview with Eileen Henry (founder of Compassionate Sleep Solutions). Understand how development affects sleep at every stage. Learn helpful tools and strategies for getting better sleep for infants and toddlers. 1. Struggle Happens– How the natural gross motor development of the infant benefits the growing child’s relationship with struggle. 4. Interview on Sleep and PPD-Post Partum Depression. 5. You Can Lead a Child to Bed, But You Can’t Make Her Sleep. 6. Child sleep does not need to be a nightmare. Learn more about my sleep program and process of getting your family the healthy and dependable sleep you deserve.